This overlay allows you to build latest git version of wine with the D3D command stream patches which create a separate command stream / worker thread for WineD3D. This work moves OpenGL calls into a seperate thread in order to improve performance up to 50~100% and in some cases making the games under Wine faster than on Windows. This patchset is made by Stefan Dösinger (here you can find his work). Please make sure you have HKCU/Software/Wine/Direct3D/CSMT = “enabled” in the registry. To do so open a shell, type regedit, browse to HKCU/Software/Wine, right click and select new->key “Direct3D”, right click and select new->string “CSMT”, double click and set it to “enabled”. In my previous post someone asked about my radeonsi ebuilds, so I decided to create a new overlay. This overlay allows you to use Keith Packard’s xorg-server glamor-server branch and Tom Stellard’s si-spill-fixes-v4 llvm branch (rebased from time to time by me). You will have to use my x11-drivers/xf86-video-ati and x11-drivers/xf86-video-intel ebuilds because otherwise they will try to install x11-libs/glamor which conflicts with >=x11-base/xorg-server-1.15.901. As I said in my previous post radeonsi is becoming faster than Catalyst in several scenarios. Some peoples on phoronix didn’t think it was actually possible and blamed “old games”. So I decided to benchmark Steam games, in particular Half-Life 2: Lost Coast, Team Fortress 2 and Portal. Unfortunately these are the only Steam games with a phoronix-test-suite profile available and they all use the Source engine. Hopefully the Phoronix Test Suite’s author Michael Larabel will provide us more profiles in the future, games with different engines. 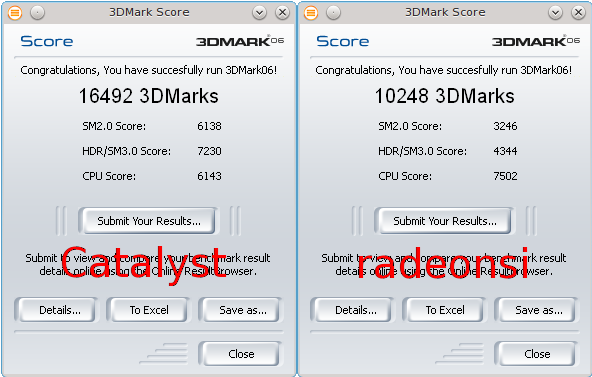 AMD Radeon HD 7950 using kernel 3.15-rc4 + PTE patches (VRAM page table entry compression) + hyperz (R600_DEBUG=hyperz). I’m also using libdrm git, xf86-video-ati git, llvm 3.5 git, mesa git (OpenGL core profile version string: 3.3 (Core Profile) Mesa 10.3.0-devel (git-cf93f86)) and Keith Packard’s xorg-server glamor-server branch (1.16.0 RC 2). Catalyst version is 14.4 (kernel 3.14.3, xorg-server 1.15.1). Radeonsi is 21% faster than Catalyst with Half-Life 2: Lost Coast. Radeonsi is 3% faster than Catalyst with Team Fortress 2. Radeonsi runs at 81% of Catalyst with Portal. I bought the Blu-ray of “The Hobbit: An Unexpected Journey” (which is considered to be a reference for video quality) and I decided to do more codec tests. If you want to know something about my methodology please read my previous article. I ripped a scene from the Blu-ray and I cropped it to 1920×800, then I compressed it using x264 LOSSLESS compression. Except for the crop it is bit identical with the Blu-ray. Then you can use Libreoffice Calc to make the graph. Some notes about the graph: yeah this is a completely different scenario from the previous test and x265 wins hand down. But beware, this is just with a VERY low bitrate. I encoded the source with x265 using CRF 28 which resulted in a 756 kbps bitrate, then I two pass encoded using x264 and vp8 with a 756 kbps target bitrate: this is the resulting SSIM graph. If you raise the bitrate there are no such big advantages using x265 over x264 which is a pity. Link. Source vs x265. I did another encoding starting with x265 CRF 23 which resulted in a 1733 kbps bitrate. Link. Source vs x265. 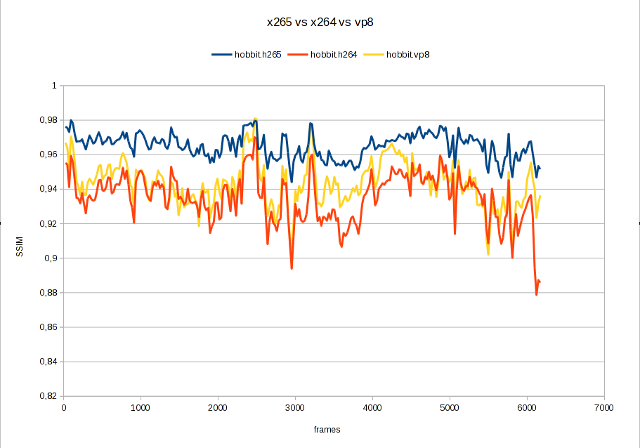 Finally I did two more tests with x265 16 bit variables CRF 28 and 23: 943 kbps and 1186 kbps. I used x264 hi10p to match the file size. I just discovered “16bpp” doesn’t mean high bit depth in x265, anyway it’s bugged and shouldn’t be used right now. Here is the SCREENSHOT COMPARATOR. Press F11 to switch your browser to the full screen mode.